A team of scientists, led by researchers at the University of California, San Diego School of Medicine, has shown for the first time how cancer cells control the ON/OFF switch of a program used by developing embryos to effectively metastasize in vivo, breaking free and spreading to other parts of the body, where they can proliferate and grow into secondary tumors. 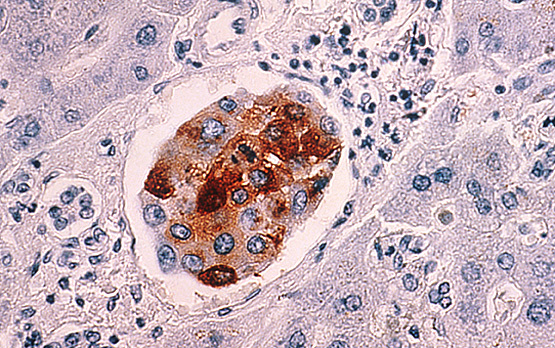 The findings are published in the December 11 issue of the journal Cancer Cell. In 90 percent of cancer deaths, it is the spreading of cancer, known as metastasis, which ultimately kills the patient by impacting ever-more tissues and functions until the body fails. Ten years ago, a French cancer researcher named Jean Paul Thiery hypothesized that tumor cells metastasized by exploiting a developmental process known as epithelial-to-mesenchymal transition or EMT. EMT is seen in developing embryos whose cells transform from stationary epithelial cells into more mobile mesenchymal cells, the latter able to migrate to new locations and create new types of tissue and organs. Thiery proposed that cancer cells also switch “ON” EMT, temporarily changing attributes so that they can detach from primary tumors, enter the bloodstream and seed new tumors elsewhere. After arriving at a new location, the cancer cells then turn “OFF” the EMT program and grow into carcinoma metastases or tumors. Using a mouse squamous cell carcinoma model, Jeff Tsai, PhD, a postdoctoral fellow in Yang’s lab and first author of the study, with help from collaborators at the Whitehead Institute for Biomedical Research in Cambridge, MA and The Sanford-Burnham Medical Research Institute in La Jolla, showed that activation of an EMT-inducing gene called Twist1 is sufficient to turn “ON” the EMT switch and promote carcinoma cells to disseminate into blood circulation. Equally importantly, the researchers found that turning “OFF” the EMT switch at distant sites is essential for disseminated tumor cells to proliferate and form metastases. Their findings indicate that reversible EMT likely represents a key driving force in human carcinoma metastasis. It’s not entirely known how Twist1 becomes active in primary tumors, though previous studies have pointed to factors like hypoxia and inflammation in the tumor microenvironment. Researchers do not know exactly how Twist1 is “turned off at distant organs.” Yang said these are subjects of current experiments. More broadly, the published findings suggest that more research is needed to determine how to target EMT to combat cancer metastasis. Several pharmaceuticals and research institutes are already pursuing EMT inhibitors as possible cancer treatments. Co-authors of the paper include Sandra Chau, Department of Pharmacology, UCSD School of Medicine; Joana Liu Donaher, Whitehead Institute for Biomedical Research; and Danielle A. Murphy, The Sanford-Burnham Medical Research Institute. Funding came, in part, from the American Cancer Society, the National Institutes of Health, the Sidney Kimmel Foundation for Cancer Research, California Breast Cancer Research program, University of California Cancer Research Coordinating Committee, UCSD Cancer Center Training Program in Drug Development and UCSD Cancer Center Specialized Support Grant.